There are many reasons to love char chaan teng in Hong Kong. Apart from the fact that there are literally one located at every corner of streets in Hong Kong, this is the closest you can get to the local culture, food wise. Of course, not all char chaan teng is created equal. Nor is its plethora of food available from its pages of menu, usually written entirely in Chinese. But if you ask me what is the one thing you can’t afford to miss eating at a char chaan teng, the answer is easy. This is not that kind of toasts you usually get from a Western restaurant. 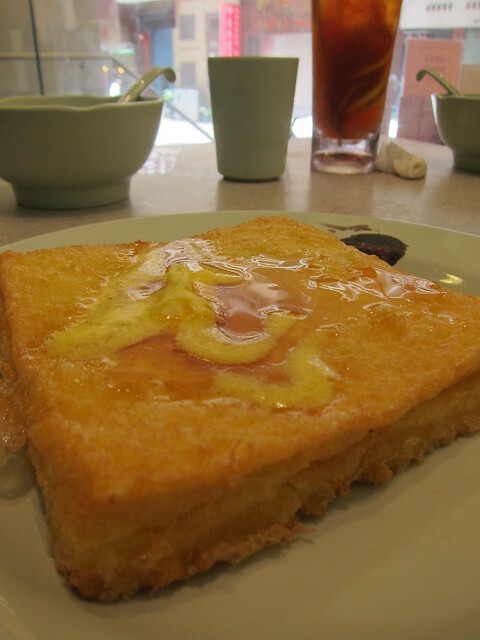 The Asian variety (or rather, the Hong Kong version) is made by deep frying stacked sliced bread in beaten egg, served with a melting slab of butter, often topped with golden honey syrup. Hmmm… typing that alone made me crave for it. … only to be followed by yet another craving. Ah, what a vicious (but oh so delicious) cycle.